The government is asking the big six energy firms to hold prices until the middle of 2015, barring any major increase in wholesale fuel costs. Industry sources have told the BBC the government wants to avoid another round of price rises that could be blamed on government green levies. It wants the commitment as part of a wider deal with firms that could cut annual bills by around £50. The government has described that as a "con", saying that governments in general cannot control the international price of fuel. But this move, if agreed, could keep tariffs on hold for at least 18 months, assuming there was no major rise in wholesale prices. That could ensure there was no increase in energy bills ahead of the next election. Labour's shadow energy secretary, Caroline Flint, said: "The truth is that only by legislating for a freeze can we guarantee that it will happen. "David Cameron won't do that because he's not prepared to stand up to the big energy companies." Angela Knight, chief executive of industry body Energy UK, told the BBC: "Only about 18-to-20% of the bill is in the control of the energy companies." She defended the industry's profit margin, currently about 5%, saying: "A business has to be profitable if it's going to stay in business." A senior figure at one of the big six suppliers, who did not want to be named, has told the BBC that he wanted to make the commitment. "We want to make it happen, but we need predictability on costs," he said. He said the key was to change the Energy Company Obligation (ECO) scheme, which requires the firms to deliver energy efficiency measures to homes. "If they can resolve the issues around ECO, that takes the gun away from our head," he added. Chancellor George Osborne is expected to announce a relaxation of the ECO commitment in his Autumn Statement next week. But another industry source warned that making such a commitment would be impossible: "We can't make that commitment while our costs are still increasing." He cited several factors linked to government policy, including the Carbon Price Floor and the Renewables Obligation, which he said would drive costs higher in the years ahead. 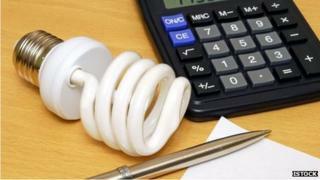 The government is seeking to spread the cost of the ECO scheme from the current 27 months to four years. The source said: "This is deferring costs, not getting rid of them." "The bus has already left the station," he added. The government is also looking at the cost of transmitting energy to our homes. This makes up 23% of an annual dual fuel bill. According to the industry regulator Ofgem, electricity distribution costs will add £15 to an average bill over the next year, but flatten out thereafter. Industry sources say the government wants that cost spread over a longer period. Such a move could potentially knock £5 annually off bills.